Many dishes have dairy products as a base or staple ingredient. If you are eliminating dairy from your diet, you don't have to eliminate these recipes as well. These helpful substitutions will aid you in creating dairy-free versions of classic recipes as well as new and exciting dishes. If you are removing soy from your diet as well, there are also soy-free dairy substitutes you can incorporate into your cooking. 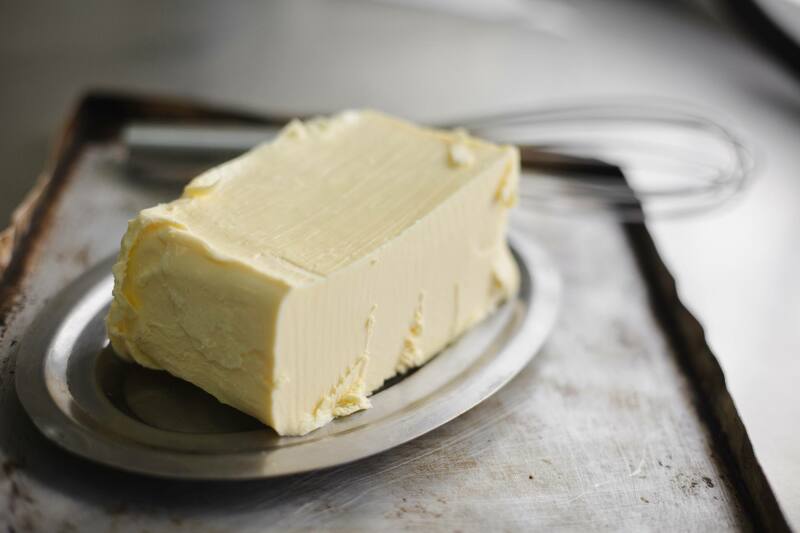 Butter is a staple ingredient in everyday cooking and baking. But there are ways to still enjoy the dishes you love while eliminating the butter. Cakes, cookies, muffins, biscuits...the list of delicious baked goods that use butter goes on and on. You can still enjoy these sweet treats by baking without butter and incorporating butter substitutes such as soy margarine. There are circumstances where oil can be substituted as well, but additional techniques are involved. If you are cooking a recipe that calls for butter, such as a sauce or meat or vegetable dish, it's best to replace with a mild-flavored oil such as canola. Soy milk combined with apple cider vinegar or lemon juice (1 cup to 1 tablespoon ratio). Allow mixture to rest in the refrigerator for 5 minutes so that it will thicken correctly. Soy sour cream blended with unsweetened soy milk (2-to-1 ratio). There are plenty of dairy-free cheeses and vegan cheese substitutes to choose from. Because these products are missing elements that help the cheese melt and cook properly, however, a simple swap out may not do the trick. Use dairy-free cheese recipes to assure success. From pasta dishes and mashed potatoes to soups and sauces, cream always adds a silky texture and smooth finish. Achieve the same results using these dairy-free substitutes. Heavy cream is not just essential to make whipped cream but is also a key ingredient in ice cream, chowders, scones, and biscuits. Replace the heavy cream with either of these substitutes and you can continue to enjoy these rich and satisfying dishes. Creme fraiche is a thickened cream with a rich texture and slightly tangy taste. It doesn't curdle when boiled so it is an ideal ingredient to add to cooked sauces or soups. It is also delicious served in the same way as whipped cream--dolloped on fruit desserts especially. Replacing with one of these mixtures will do the trick. Whether as part of an egg dish for breakfast or a bechamel to add to a baked pasta for dinner, milk can be a crucial ingredient in many of the meals. No need to give any of them up, though, with non-dairy milk alternatives such as soy, rice, coconut or nut milk. You can even make your own almond milk. Sold in a can, evaporated milk is unsweetened milk that has had 60 percent of the water removed. It is used to enrich dishes—mainly desserts but sauces and casseroles as well—and imparts a creamy texture. Substitute with soy coffee creamer or plain soy yogurt. This way, you can still enjoy baking and eating pies with custards, frozen desserts, rich sauces, and flavorful baked dishes. Sweetened condensed milk is essentially evaporated milk with added sugar. This sticky and sweet ​additive is often used to create short-cut desserts, such as two-ingredient ice cream and simple chocolate fudge. You can still make lickety-split treats using these replacements. Soy milk powder mixed with sugar heated over low heat with soy coffee creamer and soy milk. (1 cup to 2/3 cup to 1/2 cup and 1/2 cup.) Heat, stirring constantly, until thickened and smooth. Vanilla soy ice cream, melted over low heat with soy milk powder until slightly thickened (8-to-1). Some people can't even think about eating Mexican food without sour cream. Or, perhaps you bake your grandmother's sour cream coffee cake every year for the holidays. No need to ditch those habits with these suggested substitutions. Or, you can even make your own dairy-free sour cream. If you are a fan of Indian cooking then you are probably familiar with ghee—butter that has been melted and then simmered so the milk solids begin to brown and the clarified butter takes on a caramel-like flavor. Ghee has a high smoking point and a long shelf life, making it ideal for curries. For recipes calling for ghee, substitute melted soy margarine or canola oil. Is Cocoa Butter Vegan and Dairy-Free?